Tubulin Antibody (Sheep Polyclonal) - Cytoskeleton, Inc. 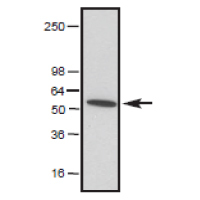 This antibody is recommended for detection of tubulin in all yeast, fungi, and animal species (Fig. 2). The anti-tubulin antibody (Cat. # ATN02) is an affinity purified sheep polyclonal antibody that reacts to alpha and beta tubulin. The immunogen used for antibody production was a mixture of purified tubulins and therefore the antibody has broad species cross reactivity from yeast to humans. Porcine extract (Cat. # EXT03) is included as a positive control and ATN02 identifies a characteristic tubulin band at 55 kD on Western blots (see Fig. 1). ATN02 is supplied as a lyophilized white powder. Figure 1. Western blot analysis of anti-tubulin antibody. Protein samples were separated by electrophoresis and transferred to PVDF membrane as described in the methods. ATN02 antibody was diluted to 50 0 ng/ml (1:1000) for Western blot analysis. Tubulin was detected in 10 µg of bovine brain extract (see arrow at 55 kD). Molecular weight markers are from Invitrogen. Figure 2. 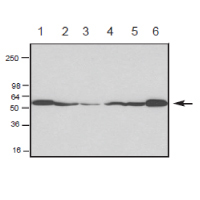 Western blot of cell extracts probed with anti-tubulin polyclonal antibody (Cat. # ATN02). Chemiluminescence detection of tubulin in extracts of Drosophila S2 cells (50 µg, lane 1) Xenopus A6 cells (50 µg, lane 2), mouse Swiss 3T3 cells (50 µg, lane 3), rat NRK cells (50 µg, lane 4), human HeLa cells (50 µg, lane 5), and bovine brain (50 µg, lane 6) at 55 kD (see arrow). The blot was probed with a 500 ng/ml (1:1000) dilution of ATN02. Figure 3. Immunofluorescence image of mouse Swiss 3T3 cells stained with Anti-Tubulin polyclonal antibody (Cat. # ATN02). Swiss 3T3 cells were grown to semi-confluency and fixed with methanol. Immunofluorescence staining using 2.5 µg/ml (1:200 dilution) ATN02 antibody is shown (red). The primary antibody was detected with a 1:500 dilution of anti-sheep rhodamine conjugated antibody. DNA (blue) was stained with 100 nM DAPI in PBS. Photograph was taken with a 100X objective lens. Figure 4. Immunofluorescence image of Arabidopsis thaliana metaphase cell stained with Anti-Tubulin polyclonal antibody (Cat. # ATN02). Microtubules are pseudocolored in green and chrmosomes in red. Image courtesy of Dr. Bo Liu, Department of Plant Biology, University of California, Davis. Methods Mol. Biol. 2015; 1208, 395-408. "Intracellular distribution of glutathionylated proteins in cultured dermal fibroblasts by immunofluorescence." Author(s): Petrini S. et al. "USP8/UBPy-regulated sorting and the development of sperm acrosome: the recruitment of MET." Author(s): Berruti G. and Paiardi C.
Anti-a/b tubulin antibody (Cat. # ATN02) was used in Western blotting to examine if succination altered the immunodetectability of tubulin modified by this PTM. "Identification of protein succination as a novel modification of tubulin"
Anti-a/b tubulin antibody (Cat. # ATN02) was used to immunocytochemically label tubulin in mammary epithelial cells in the study of the cellular response to DNA damage. J. Biol. Chem. 2012; 287, 22838–22853. "Elevated cyclin G2 expression intersects with DNA damage checkpoint signaling and is required for a potent G2/M checkpoint arrest response to doxorubicin." Author(s): M. Zimmermann et al. "Augmin plays a critical role in organizing the spindle and phragmoplast microtubule arrays in Arabidopsis." Author(s): C.-M.K. Ho et al. Plant Cell. 2011; 23, 2909-2923. "Interaction of antiparallel microtubules in the phragmoplast is mediated by the microtubule-associated protein MAP65-3 in Arabidopsis." "Changes in the accumulation of a- and b-tubulin during bud development in Vitis Vinifera L."
Author(s): L. Parrotta et al. J. Comp. Neurol. 2009; 515, 295-312. "Axon regeneration in the absence of growth cones: Acceleration by cyclic AMP." Author(s): Jin L.Q. et al. J. Biol. Chem. 2008; 283, 26188-26197. "Heat shock transcription factor 1-activating compounds suppress polyglutamine-induced neurodegeneration through induction of multiple molecular chaperones." Author(s): Fujikake N. et al. Question 1: What is the antigen that this antibody was raised against? Answer 1: The immunogen used for antibody production was a mixture of purified tubulins and therefore the polyclonal antibody has broad species cross reactivity from yeast to humans. Question 2: What species has this antibody been tested against? Answer 2: This polyclonal antibody is recommended for detection of tubulin in all yeast, fungi, and animal species including Drosophila melanogaster, Xenopus laevis, mouse, rat, human and bovine cell/tissue extracts.